Dematerialization is nothing but paperless trading, that has been introduced in a few years ago. In this process, the physical certificates are transformed into the electronic one. For this purpose demat account is used to hold securities in dematerialised form. It is often misconstrued with a trading account which acts as an intermediary between the demat account and the saving bank account. For investing in securities in an stock exchange, there is certain requirement which must be complied with. One such requirement is that an investor must possess a demat account and trading account. 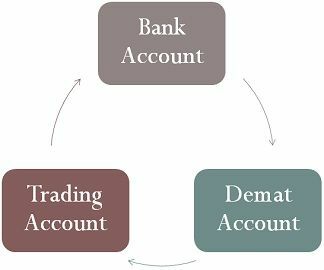 In this article, we’ve made an attempt to clarify the difference between demat account and trading account. Meaning Demat account is an account that allows the account holder (investor) to store shares and securities in an electronic form. Trading account is an account through which the account holder places an order for trading in securities. Transaction The account is used for holding securities and not for transaction purposes. The account is mainly used for the purposes of transaction of securities. Annual Maintenance Charges The account holder needs to pay AMC charges. Not paid. Suitable for Those who like to invest in the stock market and store shares in electronic form. Derivative segment traders, especially who deal in cash segment. Demat expands to Dematerialisation, which refers to a process of converting physical paper certificates, of securities issued to an investor into an equal number of shares in computerised format. After the conversion of the securities, they are transferred to the investor’s demat account. Immediate credit of the bonus/right issue to the shareholder’s account. Risk of loss, forgery and theft do not exist. No stamp duty is paid. The term trading account refers to an account which facilitates the investor to buy and sell securities. In this account, the securities are deposited with the investment broker for trading purposes. The account acts as a bridge between the saving bank account and Demat account of the account holder. Let’s understand, how these three accounts work: Suppose you have stock of A Ltd. in your demat account, and you want to buy stock of B Ltd. So, for this purpose, you need to transfer money from your saving bank account to your trading account. Now, you can buy shares of B Ltd. either from the stock market or a trader by transferring money to the seller’s trading account. Shares of B Ltd. are then deposited to your demat account linked to your trading account. In the same way, if you want to sell the stock of A Ltd. you need to take back your stock from a demat account and transfer it to the trading account. After that, the shares are sold in the stock market and the money earned is transferred to your savings account. An account that allows the account holder (investor) to store shares and securities in an electronic form is called Demat Account. An account through which the account holder places an order for trading in securities is Trading Account. For opening a Demat Account, previous approval of SEBI (Securities Exchange Board of India) and NSDL (National Securities Depositories Limited) is required, which is not in the case of a trading account. Due to which the procedure for opening a trading account takes less time than a demat account. The Demat account acts like a bank, where the securities bought are deposited and securities sold are withdrawn. On the other hand, the trading account is used for the placement of order, for buying and selling in the secondary market. Once a Demat account is opened, the account holder has to pay Annual Maintenance Charges (AMC), that depends on your stock broker. Conversely, such charges are not paid on the trading account. A Demat account is suitable for the investors who invest in the financial market and keep securities in dematerialised form. As opposed to the trading account, which is appropriate for those traders who transact in the derivative segment like commodities, index, currency futures and options, etc., especially who deal in the cash segment. To sum up, a demat account is an account which holds securities in non-physical form, whereas a trading account plays a significant role in buying and selling securities. In a purchase transaction, the trading account takes money from saving the account, buys stock and transfers them to demat account, and while selling stock, the account takes shares from the demat account, sells stock and transfer money to the savings account. At the end , we cannot buy or sell any securities without the help of trading account .Am I right ?